For a couple of years now I have wanted to make a Princess Lolly costume from the board game Candyland. I wasn’t sure how to go about making the costume. I looked at different ideas online, and tried to come up with my own take on it. All in all, this costume took about two months to put together. And I was able to wear it to the Halloween party at the Baltimore Science Center (which benefits local music programs). The hardest part of making the Princess Lolly costume was definitely the tutu skirt! I worked on it for about a week, and went through about six rolls of tulle (side note: don’t use glitter tulle unless you want to get glitter EVERYWHERE). I used pink and yellow rolls, with some additional purple, to make sure the skirt was not see through. The corset was originally white, and ordered on ebay. I hand dyed it yellow, and glued on painted pearl stickers (from Joann fabrics) to make it look like candy dots. 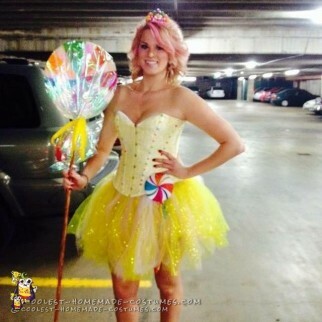 The lollipop on the side of the corset was originally a wand purchased from party city. I cut off the wand part and then used a safety pin to stick it on. My lollipop stick was the most fun part! And my favorite part of the costume! I hand painted a styrofoam circle, which was inserted with a plastic pipe from Lowes. I wrapped it in cellophane and painted the pipe brown. And I almost forgot about my candy tiara! I wasn’t sure if I should go with a big or small tiara. I had this small pink one left over from my sister’s bachelorette party (purchased at party city). I picked up REAL gumdrops, covered some in Modpodge and then hot glued them to the tiara. The gumdrops did indeed manage to stay on all night. I had so much fun creating this Princess Lolly costume, I’m not sure what to top it with next.